“An Egyptian culinary revolution” – their tagline says it all. I have been thoroughly impressed with both of my visits to Cleopatra on Westover Terrace in Greensboro. The quaint dining room is cozy and the delightful Egyptian music will add to the authentic experience. To make up for not selling alcohol, they offer a wide variety of rare and intriguing sodas and juices. The Iron Beer Soft Drink is the love child of Cheerwine and Vanilla Soda. Not having had a regular soda in a while, the sweetness is potent, but a sure treat. Our server Billal sold us on the lunch buffet, offered weekdays from 11:30-2:30. It’s without a doubt the way to go. This all-you-can-eat option introduces you to so many Egyptian flavors. The difference between many of these Mediterranean and Middle Eastern cuisines is the spice combination - Egyptians use a heavy hand with Cumin and Garlic. The lunch buffet feast begins with a fresh salad topped with crisp veggies (Red and Green Peppers, Tomatoes and Onions), dressed in an addictive vinaigrette. A cup of hot Lentil soup accompanies the salad. The soup is smooth, not chunky, and I detected a sweet note – perhaps Carrot or Butternut Squash. The pairing of these is essentially a meal in itself. I requested Pita, which we definitely didn’t need with the food volume we had coming our way, but I loved the in-house made bread. The yeast flavor really shines here. Be sure to ask for some. Cleopatra's buffet is a different interpretation of the word – yes, it’s eat-til-you're-stuffed, but the server brings a plate built for you! So if you’re worried about germs at buffets and hate the idea of everyone breathing all over the food as they look at it, fear not! Cleopatra’s does you right. The Lamb Kofta Kabab is out of this world delicious. Texturally similar to a sausage, the meat is juicy and the flavor hits you hard – one bite and you’re hooked. 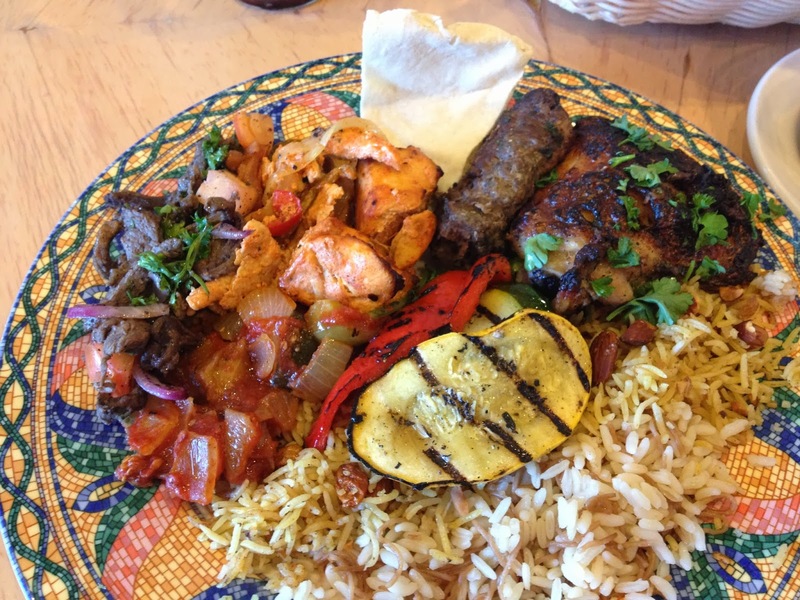 Three varieties of chicken – Chicken Kabab (un-skewered and very moist); Chicken Shawerma, shaved breast off a rotating slow broiler; and a baked Breast. Moussaka is rich, marrying Eggplant, Tomatoes and Bell Peppers. Grilled Veggies and two Rice dishes – one with Vermicelli and one with Golden Raisins and Almonds – round out the plate. I signed up for LoyalBlocks, a free app for smartphones, and received a free slice of their heavenly, buttery Baklava. (Other restaurants and shops will give you incentives for downloading this app. Neat idea.) 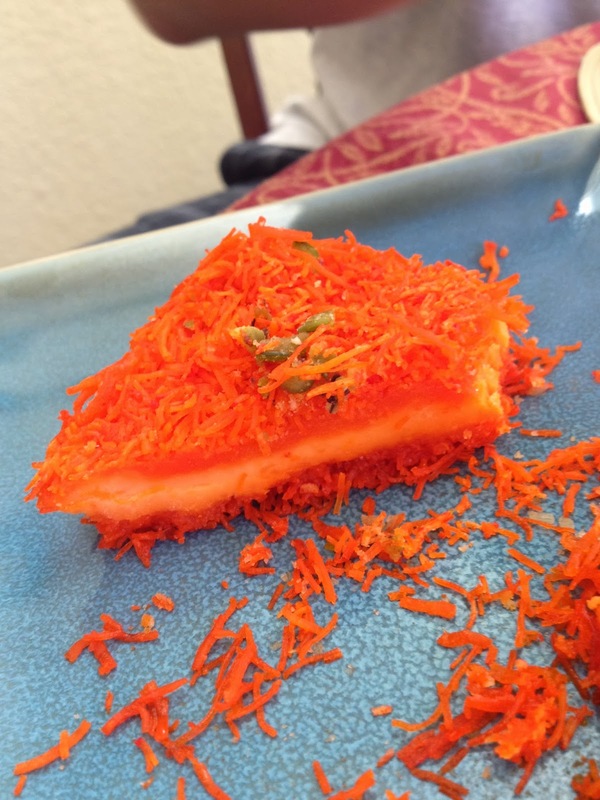 I also got a slice of their Gaber Konafa, a pastry filled with lightly sweetened cream cheese, coated with thin orange "hair" (surprisingly not carrots), topped with pistachios. Cleopatra's is not to be missed. You will not be disappointed. Check it out soon.